When I first became motivated to eat more vegetables, I was ready except for this little barrier in the way of getting started: I hadn’t met many vegetables I liked. I had met smoothies I liked, though, and one day I finally dared to try adding spinach to a chocolate strawberry smoothie. I found it highly... drinkable! Smoothies became my favorite method of eating more veggies, adding kale or spinach to the smoothie du jour. There was a distinct moment when I became really excited about smoothies. I tried Brendan Brazier’s Heavenly Pistachio Bliss smoothie recipe. The clouds parted, I heard angels sing, and I realized I could make a smoothie that tasted like my long lost, absolute favorite kind of ice cream: pistachio! I haven’t eaten ice cream for years now, since I realized dairy was taking a toll on my body. I had loved pistachio ice cream so much, though, and I actually danced with joy when I tried Brazier’s recipe! So I’m sharing one of my own pistachio smoothie recipes. My first recipe on the blog! For this one, I wanted to add spinach and not too many sweeteners while still getting a nice pistachio flavor. It’s rich and filling, with enough going on to be lunch for the day. Makes about 24 ounces. A large lunch-sized serving (the jar pictured above, full) or 2-3 snack-sized servings. It's important that the ingredients go into the blender in the order below. With the cushion of the nuts and oats, for example, the chia seeds will be less likely to stick to the sides of the blender. Don't worry if you don't have a Vitamix. A standard blender should be able to handle this recipe. If it struggles, just add more milk. 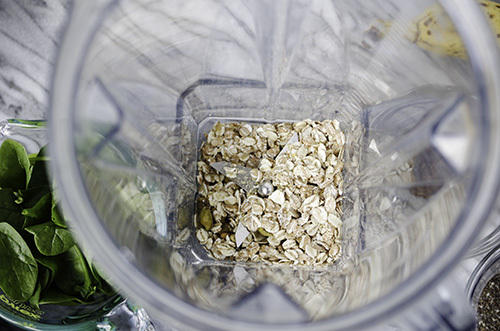 1/4 cup shelled, raw, unsalted pistachios and 1/8 cup oats, into the blender jar. Don't have an 1/8 cup measuring cup, you say? Alas, most of us don't. Just fill the 1/4 cup half way and voila! If I'm having this for lunch and not sharing, I probably wouldn’t have many more nuts through the rest of the day. I want to balance my nuttiness. Then the following: 1 Tbsp cacao nibs and 1 Tbsp chia seeds, one large or two small dates, pit and stem removed. 3/4 cup spinach leaves, one peeled banana, 3/4 cup ice, 1 1/2 cups unsweetened nondairy milk (I use vanilla almond), 1/2 tsp vanilla. I've learned that if I go too crazy with the spinach, the bitterness of it tends to come to the forefront, when I really want it to take its super powers and chill in the background while pistachio or fruit takes the front seat. You can start with a bit less spinach than 3/4 cup if you aren't used to adding it to your smoothies. You can always add more if you want to. 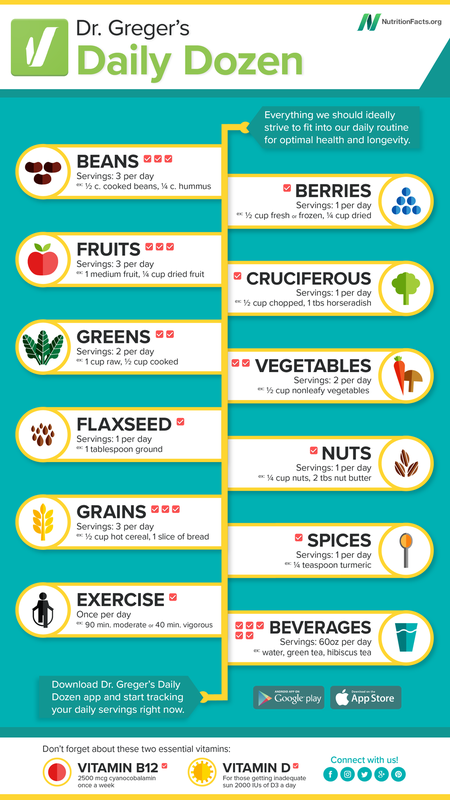 I’m really trying to stick with whole foods, so for boosts, I like to use chia seeds, wheat germ, oat bran - in other words, individual ingredients that give it enough oomph rather than protein powders. 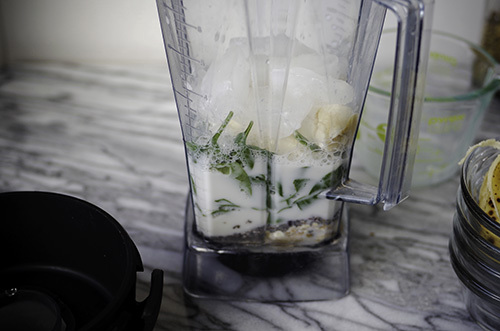 The milk should cover at least 2/3 of the other ingredients in the blender so that it blends easily. If needed for your type of blender, add more milk to get it blending. Now it's time to turn on the blender! Once it looks like the ingredients have blended together, count slowly to 10 as you allow them to become more fine and smooth. For a more chocolaty version, add 1 Tbsp nondairy chocolate chips. For an even richer and creamier version, add 1/4 medium avocado. I try to savor my smoothies, taking my time to avoid flooding my system and just savor the flavor. And I like to drink water right after a smoothie, swishing it around in my mouth to rinse my teeth after. Speaking of teeth, I get to have gum surgery today, yippee. So I may be living on a smoothie bowl version of this recipe for the next few days. At least there's an upside. Wondering where I got my favorite smoothie jar, shown above? I will be talking more about Wow Wow Hawaiian Lemonade in the future. One of my newly discovered favorite places!